Definition at line 24 of file MachineBranchProbabilityInfo.h. Definition at line 38 of file MachineBranchProbabilityInfo.h. 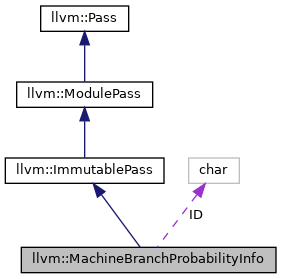 Definition at line 43 of file MachineBranchProbabilityInfo.h. References getEdgeProbability(), getHotSucc(), isEdgeHot(), printEdgeProbability(), and llvm::AnalysisUsage::setPreservesAll(). Definition at line 48 of file MachineBranchProbabilityInfo.cpp. Referenced by llvm::TailDuplicator::canTailDuplicate(), llvm::RegBankSelect::EdgeInsertPoint::frequency(), getAnalysisUsage(), getBlockName(), llvm::HexagonInstrInfo::getDotNewPredJumpOp(), getHotSucc(), getLayoutSuccessorProbThreshold(), getNewValueJumpOpcode(), greaterWithBias(), isEdgeHot(), MaySpeculate(), mergeOperations(), parseCond(), printEdgeProbability(), splitMBB(), and UpdatePredRedefs(). Definition at line 42 of file MachineBranchProbabilityInfo.cpp. Definition at line 62 of file MachineBranchProbabilityInfo.cpp. References E, getEdgeProbability(), llvm::BranchProbability::getZero(), I, StaticLikelyProb(), llvm::MachineBasicBlock::succ_begin(), and llvm::MachineBasicBlock::succ_end(). Definition at line 55 of file MachineBranchProbabilityInfo.cpp. Referenced by getAnalysisUsage(), and printEdgeProbability(). Definition at line 81 of file MachineBranchProbabilityInfo.cpp. References getEdgeProbability(), isEdgeHot(), and llvm::printMBBReference(). Definition at line 36 of file MachineBranchProbabilityInfo.h.